With the Pikes Peak Hill Climb drawing closer, Volkswagen discussed the combined visions that brought the curvy hill racer to life. 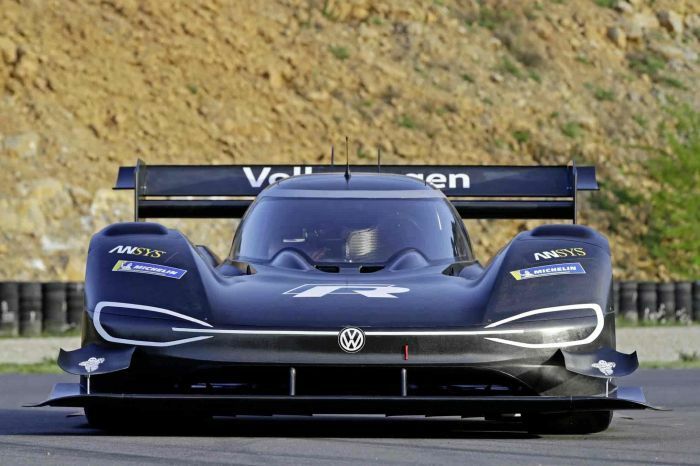 With the Pikes Peak Hill Climb a bit over two weeks away, the Volkswagen team is now into testing the I.D. R Pikes Peak. It is VW’s electric entry into the annual mountain climb-endurance test. Though the race lasts only minutes as the powerful cars eat up the 12.42-mile course, the design and engineering efforts that automakers invest are considerable. The VW team has already done extensive aerodynamic testing and is now running the I.D. R Pikes Peak on the course to dial everything in for the race. Notice the name of the single-seater. It is the I.D. R Pikes Peak. Officially it is part of VW’s I.D. family of electric cars. Ultimately, there will be four I.D. vehicles – at the moment – the I.D. hatchback, the I.D. Crozz, the I.D. Buzz and the I.D. Vizzion SUV. The hatch will be first to market later this year. The Crozz crossover and Buzz come in 2019. The Buzz, a multipurpose – MPV – a vehicle that takes its design cues from the famed VW Microbus. The Vizzion will be available by 2020. To cement its place as a member of the family, the design team had to combine elements of the I.D. themes into the racer. As pointed out by Motor1, “Skinny LEDs in the shape of more traditional headlights are the most obvious nod to the brand's upcoming lineup of electric vehicles.” Aerodynamics Marks VW's Pikes Peak Climb Challenger. The curvaceous vehicle came together with incredible speed. The project launched in October 2017. And, VW debuted the racer in April. For this year’s hill climb VW tried a new approach. Rather than let the engineering staff define and essentially design the vehicle, the automaker brought together elements of the engineering and design staffs and had the work closely so that when the designers had free reign once the basics – weight, height, and length – afterward. The design team was able to sculpt the I.D. R Pikes Peak into the slippery vehicle that will carry the automaker’s hopes for a new record for EVs in the hill climb. The curvy, downforce-heavy design with its unique rear wing and substantial front edge winglet that contributes to the enormous downforce generated by the I.D. R Pikes Peak was the result of the close working relationship. Both staffs have contributed their talents, and they continue to tweak the final product as the race date nears. Indeed, the racecar is undergoing substantial testing on the track to make sure the tweaks work. The race car is carrying the hopes of VW that it will set a new record for “Unlimited” EVs. Former Le Mans winner Romain Dumas has been picked to pilot the I.D. R Pikes Peak. VW hopes he will make the run faster than the 8:57.118 mark set for EVs. Also, the automaker is quietly hoping the I.D. R. Pikes Peak will set a new overall mark for the 12.42-mile race. The I.D. R Pikes Peak packs a lot of power into its curvy body. The main power comes from a pair of electric motors that produce a total of 680-horsepower and a massive amount of torque, 480-pounds feet. The powerteam whisks the rather lightweight racer from 0 to 100 kmh (62 mph), in 2.25 seconds, which is quicker than a Formula One racer. June 24, the date of the hill climb, will tell everyone if all the work paid off in the record.